UNIADEX, Ltd. (headquartered in Koto-ku, Tokyo; President & CEO Yasushi Iribe and a wholly owned subsidiary of Nihon Unisys, Ltd.) won first place in the Eighteenth Customer Satisfaction Survey conducted by Nikkei Computer, a comprehensive IT-related journal published by Nikkei Business Publications, Inc. (Nikkei BP). It received this accolade in the field of system operation-related services (information service providers). The company has won this high rating for two consecutive years. 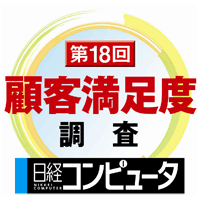 First place in the Eighteenth Customer Satisfaction Survey in the field of system operation-related services (information service providers), the August 22 issue of Nikkei Computer. This award reflects the undiminished high regard customers have for our service policy continuing on from last year. This involves providing a one-stop service in an expeditious manner when dealing with problems that arise in any phase of operations. This begins with receiving reports of problems through to completing repairs in a multi-vendor environment made up of a wide range of devices. This high assessment was also due to our commitment to giving customer needs the highest priority and of paying the utmost attention to security risks, undertaken under the slogans of "Picture the customer" and "Be prepared." This reflects the high regard customers have for our "policy of hospitality" that we are committed to providing. UNIADEX will expand its services by providing flawless support and logistical assistance in the field, and by strengthening its ability to foresee problems in systems that are constantly growing in complexity, and propose solutions. This customer satisfaction survey examines computer user companies to find out their level of satisfaction with the systems integration and operation services provided by IT vendors, as well as with hardware/software products, such as servers and ERP packages. The current survey was planned and organized by Nikkei Computer, a comprehensive IT-related journal published by Nikkei BP, and Nikkei BP ICT Innovation Research Institute, a think tank in the ICT field established by Nikkei BP in January 2013. The survey was conducted and complied by Nikkei BP Consulting. The survey questionnaires were sent by post to the information system divisions of 11,134 companies/organizations nationwide, representing companies listed on Japan's securities exchanges including those for emerging companies, unlisted enterprises with annual sales of 20 billion yen or more, government departments and other public agencies, and municipalities other than villages. The survey was undertaken from May 7 to June 12, 2013, and received 1,725 valid responses (valid responses as a percentage of total questionnaires sent out: 15.5%).